This is it right here. 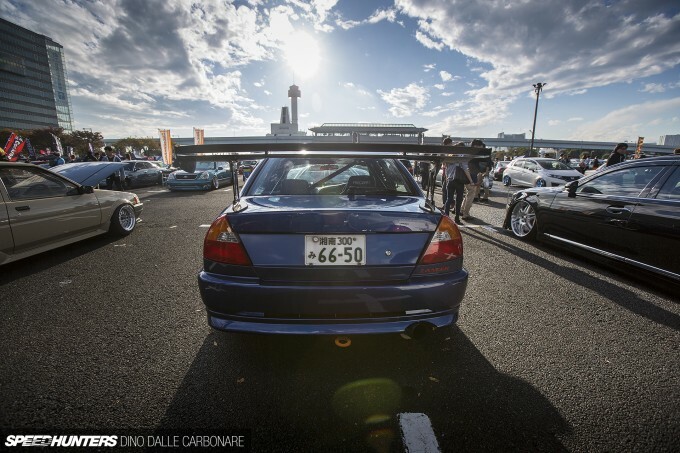 This is what I want to see Japanese tuning move towards in the next couple of years. I came across this Evo VI as I was leaving StanceNation Japan at Odaiba on Sunday, and it stood out to me because it was probably the only Mitsubishi Lancer at the event that didn’t have excessive amounts of negative camber, and was obviously built for performance. Visually, the car was sporting a Tommi Makinen Edition inspired front bumper with pumped rear flares and running a set of Barramundi Design Eleven wheels. Touches like the Dunlop semi-slick tyres and AP Racing brakes were further hints towards its purpose. But nothing could really prepare me for the engine bay! Where to start? Well, one thing I can say is that the guys at S&A Autocreate really know what they’re doing, because engine aside, this sort of presentation is far from a common site in modified performance cars in Japan. 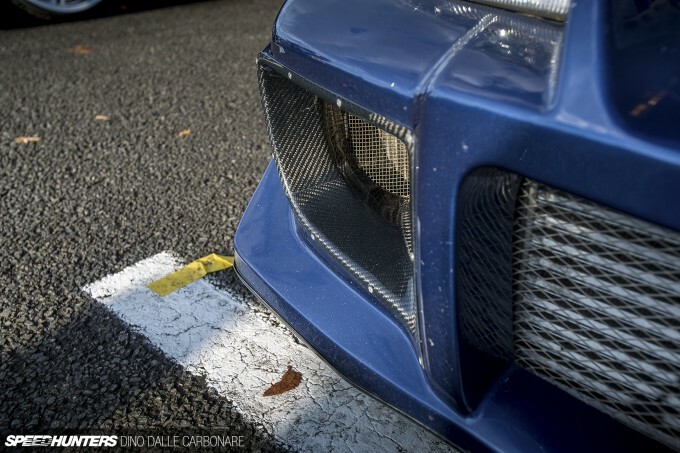 Sure, things are changing and getting better, and there are some exceptions to the rule, but the majority of built cars you come across in the Land of the Rising Sun rarely impress when it comes to attention to detail. But not on this Evo. The engine bay has been cleaned up, shaved, wire-tucked and finished in the same metallic blue as the exterior in preparation for the mother of all built motors to be dropped in on a set of billet engine mounts. I’m going to save the details on the engine for when I fully feature this car, because I have to feature it, but to list a few things, it’s bigger than 2.0L – possibly based on a 2.4-liter 4G64 block – and runs a twin-scroll BorgWarner EFR turbo on a Full-Race manifold with a pair of Turbosmart external wastegates managing boost. The big EFR feeds the engine through a Plazmaman intake manifold, and the billet fuel rail is also from the same manufacturer. And speaking of billet, the engine runs Frontline Fabrication’s 4G63 cam covers machined out a block of aluminium. And yes, even the cover that seals off the cam pulleys and timing belt is a billet item too. The car is dotted with amazing detailing, and that goes for the interior as well, which although stripped for weight reduction has some nicely laid out additions. This Evo left me with a big smile on my face because it’s exactly what I want to see Japan do more of. That is, thinking outside the box, putting emphasis on the smaller details and not being afraid to experiment with trusted and proven performance parts from abroad. What do you guys think? This thing looks quite good. I hope it sees plenty of track time, but even if it doesn't, it does seem like a most excellent build from what I can see. Of what I have seen so far, I'm very impressed at the craftsmanship. It's also nice to see the Tommi Makinen bumpers on a non-red Evo. Look forward to seeing more. This is my kind of build. Art. Now that exhaust manifold was real ART, FUNCTIONAL ART. This EVO, no doubt, one SILLY FAST monster. That Evo is awesome!! Can't wait to see this tear up a track soon! 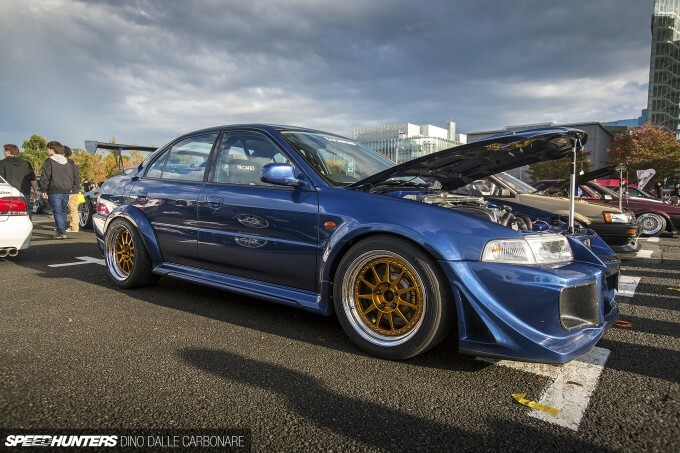 Trends comes on goes, but to me a track weapon like this EVO leaves a lasting impression. 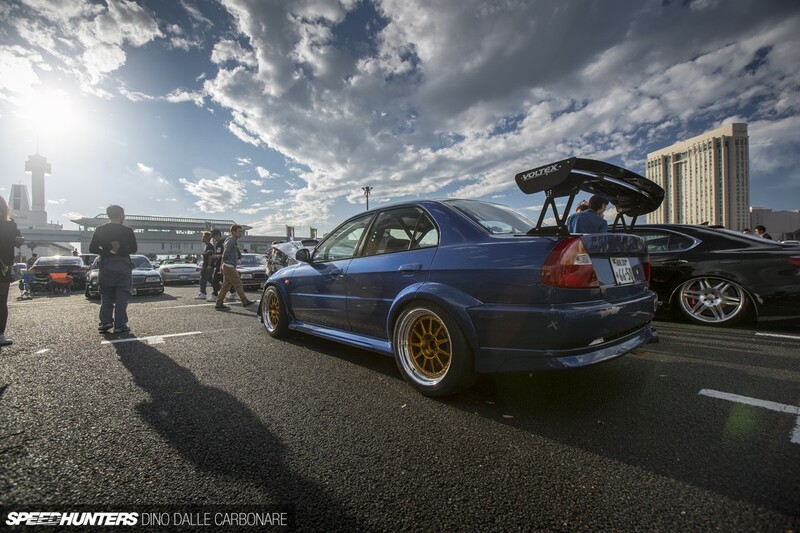 Nice evo, but isn't that front bumper a varis one ?, I actually know for sure it is a varis front bumper. hi speedhunters_dino the car next to it,slammed full size lux...what car is that?w221 s class with barbs wheel? 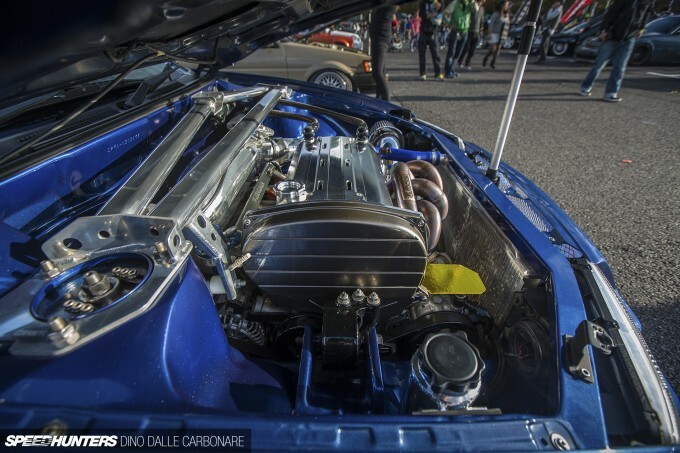 That's some seriously clean engine bay there! So clean, you can eat off it! Awesome, awesome, awesome. I would like to see this thing climb a hill. This really is awesome, I never see CP9A's here. Finally a little bit of inspiration for mine! We all love a good show car, but there's nothing like brute strength. Can't wait to see the numbers on this classic beast! DRiFTaddict I've gotta agree with that. Something about the rear arches having an added-on look, but the front arches flowing in one piece just causes a visual dissonance on an otherwise amazing looking car. Smiggins Yep they are slowly being discovered despite me having told people about them for years! EH098 THE Evo to have! Don't ever get rid of it! Cant wait for the full feature, this things fantastic! "Lobster" exhaust and manifold are true works of art. speedhunters_dino Haha! This is exciting... Umm, I'd say in the neighborhood of 850 HP. That engine bay is strictly business. I love the approach to this car. The way the exhaust manifold is shaped, the very very clean engine bay, and the little touches to the exterior. I love it and can't wait for the feature on this. Reminds me of the Wangan Midnight Run Evo. 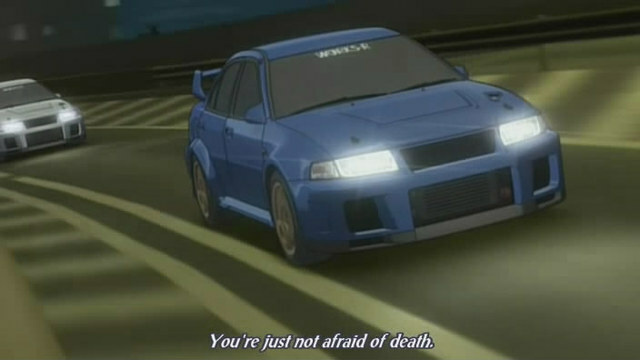 I think it was an Evo V raced and owned by a character named Eiji. BTW, this is a very nice car. Made me drool! KRaZyAmmo It's giving me a lot of inspiration I tell you! jbfromsiliconvalley Full Race, best out there for sure! What a beauty! I hope to eventually get mine to that overall standard. Will have to keep chipping away at it. Dino, here in NZ the Evo III has generally always been the most cherished with enthusiasts. Is it the VI that is the most highly regarded in Japan? RobIsKoolas Yeah probably the TME but you just don't see too many, maybe people are saving them away and getting on with tuning 7-8-9s. 1-2-3s I hardly see any more! my heart was broken when you posted the StanceNation thingy,... but this is more than making up for that. looking forward to the full feature of this car! AlexKing1 speedhunters_dino jbfromsiliconvalley Do have to say, I really like their cast merge collectors. Does your header have one of those? Thing is straight out of initial D.
speedhunters_dino Option86 True, it really depends. Gonna be an awesome feature either way! Thanks, Dino! speedhunters_dino Kirk_B I shouldn't have typed so quickly. I didn't mean to make it sound like I said this was a TME, but the TME look. Thanks for catching. The main point I was getting at was the colour (which I like). Any TME Evo 6 that was made available in Canada has been red and white, and very few Varis kitted Evo 6 in Canada either, so either is a welcome site. I'll wait for the full feature to know more. abezzegh87 It's a preference thing. The 4G64 doesn't have oil squirters in the block (a machine shop can tap the block for them though), and the cylinder walls are thinner. I went with the 2.3 over the 2.4 because I already had a good 2.0 block. 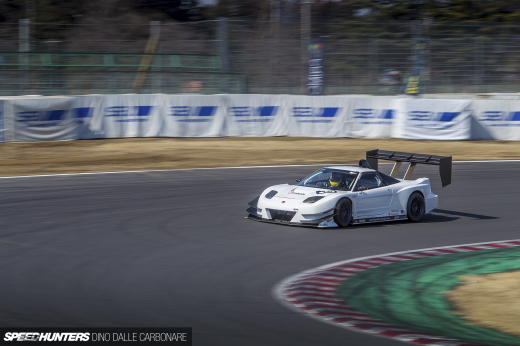 If only Hypertune made a full kit like Full-race. What kind of transmission an automatic like in the need for speed you signed off on? speedhunters_dino KRaZyAmmo And so it should Dino! Love this. 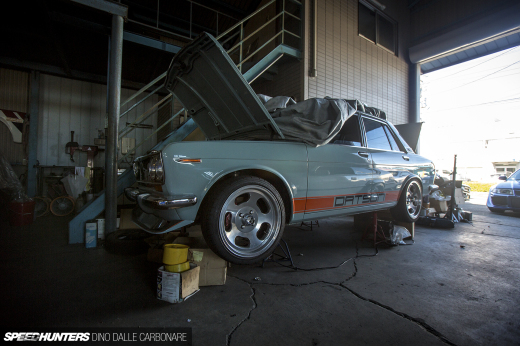 This is why I come to Speedhunters. Not a JDM fan particularly, but the approach is perfect. speedhunters_dino Yo Dino bro! Find an Evo 3 for us please! I miss seeing those! The Evo IX MR are great... But my favorite will always be the Evo Vi. And that's one clean engine bay!